Last night was the anniversary of the invention of Guinness, apparently. Anyway, as you can imagine, the whole city went crazy! Guinness, of course, is the local brew. The company had put on shows all over town and I think just about every student in the city was on the streets. I heard rumours of free pints, but didn't find anyone. It didn't matter and I actually didn't even drink all that much because we (I went out with a bunch of guys from my department at TCD) spent most of the evening wandering from one joint to another. At one point, we hooked up with a bunch of medical students from Nigeria, who were celebrating and waving little Nigerian flags. 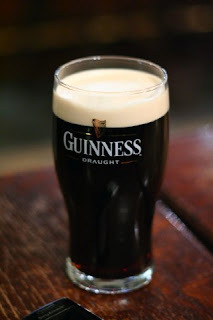 This seemed kinda odd so I asked them why and they told me that where they come from Guinness is actually brewed and that it's madly popular in Nigeria. Go figure. I also came home armed with a recipe for Guinness Beef Stew that they were handing out in one of the bars, so I guess I'll give that a lash. Things are not great in the flat right now with Bepe feeling so-so about the girlfriend and her failure to find a job and blah and I guess I wasn't necessarily all that diplomatic about her when she was here. If I can manage to knock together a good stew, I think he'll be pleased as he's always deploring my eating habits. Which is a bit mean as he's a chef and I'm, well, not. I'm planning to stay in tomorrow and do that. Not tonight tho'. Tonight is Culture night! What a cool idea; museums and venues all over town are open until late with free entry for everyone. I actually think that they should do this more often, because it's not always easy to get to stuff during the day. But I am not complaining; this is the coolest idea. I'm gonna grab a burger at Captain America's and pound the pavements from one culture hotspot to another until late! I can't believe that freakin' NERVE of Bepe's girlfriend! I was all geared up to go to the International with Saoirse when she comes in in a pair of rhinestone infested jeans. "Oh goodnight," she said. "Early for going to bed." "I'm just heading out," I said. "I see," she said. "I was confused because of your pyjamas..."
Pyjamas??? I might not be as gaudy a dresser as some people but I was wearing MAKE-UP. "Oh look, you've got one of those children's stick-on tattoos. Just as well it will come off, coz who would want a bat on their wrist forever." Especially as I have to make it up to Saoirse after having to cancel the other night. This afternoon, I'm going to try and find this place my local greengrocer told me about. Apparently it's not far from here: a cemetery dedicated to or maybe the resting place of some fallen heroes or other. I am pretty hazy on the details of Irish history. The Irish sure do like their cemeteries. But I'm not complaining: as a student of 19th century lit., anything gloomy is right up my alley! "Well, I'm not the one who got back together with his cheating girlfriend, so if anyone is stupid..."
Things have been pretty tense since then and I find myself wondering for the nth time if maybe I should just move out and find someplace else to live. Thing is that I love where this apartment is--it rocks looking out the window and seeing the Liffey and the Ha'penny Bridge and most of the time we actually have a lot of fun together sharing this house. But with the girlfriend...well, three is a crowd and while obviously she's gonna be here some of the time there's been no mention of her chipping in to pay for all the hot water she consumes in the shower and hand-washing her stupid lingerie. That might sound petty, but I'm on a budget here. On a cheerier note, college is going really well. I like my supervisor, I like the other students and Trinity is a lot more fun with more structure to my day. They all seem impressed with all the pre-reading I've done and, of course, there's the constant thrill of will-I-or-won't-I see the Beautiful PhD Student on whom I've got such a crush. As for the entertainments this week, there's a comedy festival on that is out of my budget -- but I don't feel hard-done-by. I'll be hitting my usual comedy joint, the International! Maybe even tonight, if I can get someone to come with me.